Remember the Glif? Have you ever heard of the Glif? It is a tripod mount for the iPhone that started life as a Kickstarter social funded project by a couple guys that make up Studio Neat. The design of the Glif is simple… silly simple, but works great. Generally there are two things you are doing when having your iPhone mounted to a tripod, both involve not moving the iPhone while taking a lot or long exposures. So, night/movement shots and stop animation shots. 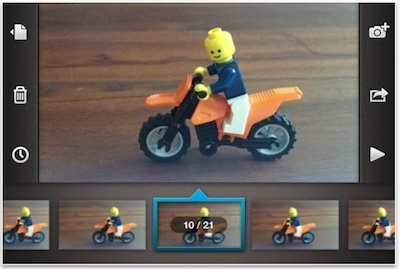 Staying with the ‘keep it simple’, Studio Neat has introduced their own Stop Motion app – Frames. The use of the app doesn’t require you own a Glif, it just makes the process easier since you not worried about moving the iPhone between shots. Frames offers a self explanatory interface where you snap photos (720p HD) to make up your animation. Focus/exposure can be locked, the speed of playback can be adjusted, and images can be added in between previously taken images if you need a change in detail or changed your story idea. The finished result is saved to your iPhone’s (and iPod Touch) photo library. Yup, not a ton of features in Frames for the pro but a killer app for all of us ‘would be’ stop motion movie lovers that want a inexpensive way of jumping in. Recordings don’t just have to be flip card like animations, imagine recording a sunrise or sunset that you can now share with others.